A website using WURFL device detection can instantly learn a user’s smartphone price. This info is one of the few economic indicators that a website can instantly discern about a customer. Websites’ user bases vary based on their affluence and willingness to purchase. MSRP (Manufacturer’s Suggested Retail Price) is a great tool for identifying a user’s economic preferences. In our MOVR research, we studied billions of hits and profiled them by their website category. 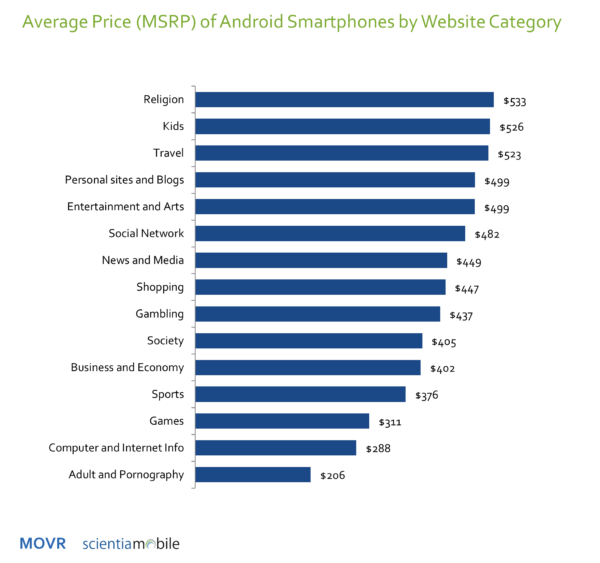 There is an over $300 variance in the average price of Android smartphones that visit these sites. Right in the middle are Shopping websites at $447/smartphone. Not surprisingly, e-commerce sites draw a wide range of users and their average MSRP is well-distributed. The bookends of the data have Adult sites at the bottom with $206, and Religion at the top with $533. MSRP is an indicator of willingness to pay. Based on this, Adult sites face a huge hurdle to convert a user to paid based on how cheap the users are about their smartphones. On the other hand, it appears religion sites might already be “preaching to the choir” given the high willingness to pay for a smartphone of their user base. Websites can use this MSRP economic intelligence in real time to target their sites and content more effectively. For example, a shopping site can rearrange their list of “featured” items based on the willingness to pay based driven by MSRP. When millions of dollars are transacted, this type of user-centric customization can drive significant additional sales. For more information, sign up for MOVR and download our 2017 Q1 report. What Is The Release Date of Phones Visiting My Website?